This article focus to discuss on Conditions for Monopoly. In a monopolistic market, there is no difference between the business’s supply and market source. 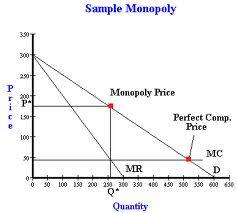 Three conditions characterize a monopolistic market structure. First, there is only one firm operating out there. Second, there are large barriers to entry. These barriers are so high which they prevent any other firm from entering industry. Third, there are no close substitutes with the good the monopoly corporation produces. Because there are usually no close substitutes, the monopoly will not face any competition.